Eight Tone Zone runners took part in the New York marathon. In ideal conditions, Nina Baldwinson was the first to finish for the club in an impressive 3hr 47min 29sec. She said it was a truly amazing day and she was pleased with her time after a couple of injuries and a recent fall in training. Next up was Neil Studwick in 3.56, closely followed by Andy Mair, with Mark Williamson just behind at 4.30. Making his marathon debut was Neil Pacey, who was feeling apprehensive before the start. Luckily he had his wife and vastly-experienced marathon runner Debs Pacey to keep him going. The race started really well for them both with an even pace through the opening 18 miles but as Neil’s legs tired and the course toughened he started to struggle. With Debs’ encouragement he dug in and finished in 4.46. He said: “Anyone thinking about running a marathon, do the New York Marathon! The crowds from start to finish were amazing. 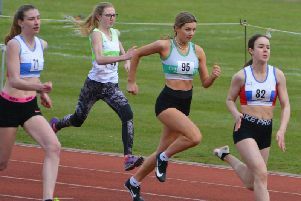 “To be able to say I’m now a marathon runner and to have experienced the atmosphere is something I will truly treasure.” Grace Natoli completed her run in 4.56 and also making her debut was Bushka Skladanek with 5.11. On the other side of America, Sarah Baker and Stephen Brown took part in the San Francisco Golden Gate Half Marathon. This was Brown’s first 13-mile race, which he completed in 2.16. The inaugural Cowdray 5k and 10k race was staged by Southern Multisports. The race took place on a 5k course with stunning views of the Cowdray ruins, a true cross-country run across the grassy fields, through the woods, up the hills and then with a few nice downhill sections. The event was well supported with friendly marshals. Taking first place in the women’s race was club runner Juliet Stallard in 46.31. All finishers received a medal and a burger. The Meon Valley Marathon took place on a bright but cold Sunday morning. With nearly 3000ft of total ascents and one climb of almost 800ft, this is not for weak. Simon Bodsworth and Paul Coe, the latter taking part in his 38th marathon, ran together, finishing in 4.29. Tony Holcombe crossed the line in just over five hours with Jade Fish completing the Tone Zone entry in 5.42. Tone Zone times: New York Marathon - Nina Baldwinson 3.47.29; Neil Strudwick 3.56.13; Andy Mair 4.08.25; Mark Williamson 4.30.44; Debbie Pacey 4.46.26; Neil Pacey 4.46.27; Grace Natoli 4.56.08; Bushka Skladanek 5.11.23. San Francisco Golden Gate Half Marathon: Sarah Baker 2.16.00; Stephen Brown 2.16.00. Meon Valley Marathon: Simon Bodsworth 4.29.36; Paul Coe 4.29.39; Tony Holcombe 5.05.52; Jade Fish 5.42.00. Meon Valley Half Marathon: Laura Newell 2.05.34. Cowdray 10k: Laurence Ward 43.30; Duncan Stephenson-Gill 46.02; Juliet Stallard 46.31; Tony Holcombe 50.01; Cheryl Laing 55.23; Robert Little 55.23; Jo Hall 56.57; Daniel Hughes 58.12; Lisa Robinson 59.49; Debbie Patching 1.01.55; Debi Haddleton 1.11.07; Nicky King 1.13.10; Donna Vincent 1.18.39. Cowdray 5k: Becky Jones 31.10; Brenda Glendenning 47.29; Jean Morris 49.21; Peter Chittenden 54.1.